For some of my fellow Christian friends, the day before Good Friday is called Maundy Thursday. One of the highlights of this day is the ceremonial washing of the feet from when Jesus washed His disciples’ feet in John 13. As I researched this passage, I was struck by how little I really understood the significance of Jesus’ action. Here are just some of the reasons why Jesus washed His disciples’ feet. 1. Jesus wanted to show His disciples the power of humility. Power and humility may seem like polar opposites, but there is greater power in humility than in lording authority over people. In fact, humility is divine power. Philippians 2:5-8 gives us a vivid picture of this. Your attitude should be the same as that of Christ Jesus: Who, being in very nature God, did not consider equality with God something to be grasped, but made himself nothing, taking the very nature of a slave, being made in human likeness. And being found in appearance as a man, he humbled himself and became obedient to death–even death on a cross! When Jesus was born, He laid aside His privileges as God and became a human with very humble beginnings. Notice that Jesus was God and not yet human when He determined to be humble and used His divine power to become a humble slave. We cannot be humble without God’s power in our lives. Even when we try to be humble in our own power, aren’t we really doing it for some benefit? When we give to charity, do we do it for the tax deduction? When we build a house for the poor, do we do it because it makes us feel good? When we help someone in need, do we do it for the attention or a good reputation or a great Facebook status with accompanying pictures to prove it? When we serve, are we doing it for the right reasons and with the right motive and attitude? Without God’s power, we can’t. Even when Peter was trying to be humble, he failed – twice! When Peter at first refused to let Jesus wash his feet and then when he exclaimed, “not just my feet but my hands and my head as well!” he was dictating to the Lord (as if he was the real lord) what He was allowed to do and how He should do it; it was all about Peter. 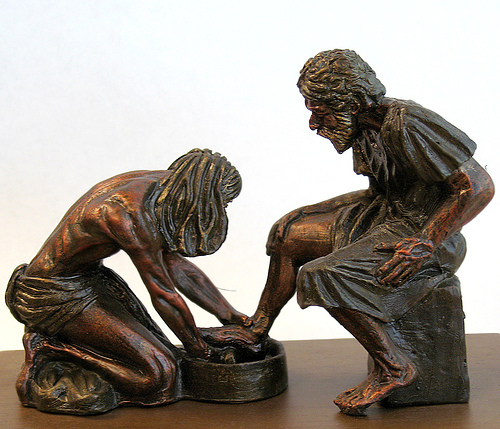 Rather than assert His lordship over him, Jesus asserted His position as Peter’s servant and washed his feet. William Temple says, “We rather shrink from this revelation. We are ready, perhaps, to be humble before God; but we do not want Him to be humble in His dealings with us. We should like Him, who has the right, to glory in His goodness and greatness; then we, as we pass from His presence, may be entitled to pride ourselves on such achievements as distinguish us above other men.” In other words, we might feel that we are ready to serve a great and majestic God because, in doing so, we can brag about how wonderful it is to have the privilege to serve such an awesome God. But what if the King and Creator of the Universe, who is all-powerful and has every right to flaunt His power, gave up His rights and humbled Himself by becoming a slave, the lowest position a human could be? Maybe it wouldn’t feel like much of a privilege. Maybe it would not seem to be anything to brag about. And yet humility might be the greatest proof of God’s power working through us. 2. Jesus wanted to show His disciples “the full extent of His love” (13:1). This phrase can also mean He “loved them to the very end.” John intentionally uses other double-meanings in his gospel and it is likely that he means both meanings here as well. Love comes up later in the chapter in verses 34-35. “A new command I give you: Love one another. As I have loved you, so you must love one another. By this all men will know that you are my disciples, if you love one another.” Fully loving one another therefore means serving one another humbly just as Jesus did when He washed His disciples’ feet. 3. Jesus did it to be an example for us to follow. “Now that I, your Lord and Teacher, have washed your feet, you also should wash one another’s feet. I have set you an example that you should do as I have done for you.” Some churches take this command literally, but Jesus’ point is not merely to institute a new sacrament so much as to initiate a new attitude of leadership and discipleship. He is saying that if we are really His disciples, we will follow His example of humility and love. 4. Jesus did it to foreshadow the ultimate expression of His love and humility: His death on the cross. A. In verse 1, John says “Jesus knew that the time had come for him to leave this world and go to the Father,” an obvious reference to His death and resurrection. B. When Jesus talks about taking a bath and announces that “you are clean” in verse 10, He is referring to the cleansing from sin as a result of His upcoming death. C. In verse 4, John tells us that Jesus took off his clothes and laid them aside. The Greek word for clothes is plural, meaning he “stripped to a loin cloth, just like a slave.” (NICNT, p. 547) John only uses this word again when He describes Jesus on the cross, stripped of His outer garment and undergarment, just as He was when He washed His disciples’ feet. This Easter may we remember Jesus not merely as the glorified Messiah who God the Father raised from the dead, but may we also remember Him as a humble slave, willing to wash our feet and even die a humiliating death so we could be cleansed from our sins once and for all. Even more than that, may we follow His example and serve each other humbly as He did for us. He is risen! I enjoyed this reading today. There is no greater source of understanding and living in humility. It serves to keep me engaged in the mighty example of love Christ demonstrated as He prepared to save us eternally. I must say that your work here is timely once again. God bless you Jon.